Authors for Bookstores Campaign (#authors4bookstores): A Note About Terms: Pardon us parsing what might seem obvious but publishing terms are slippery these days. For the purposes of our campaign, “author” is any writer who has published a long-form work of fiction or nonfiction, either via a trade publisher or self-publishing platform; and “bookstore” is a physical store selling print books (pbooks). The Alliance of Independent “Authors for Bookstores” campaign was launched in 2015, at iconic London bookshop Foyles, during London Book Fair’s Indie Author Fringe. It was spearheaded by author and ALLi Publications Manager, Debbie Young, and novelist Piers Alexander. 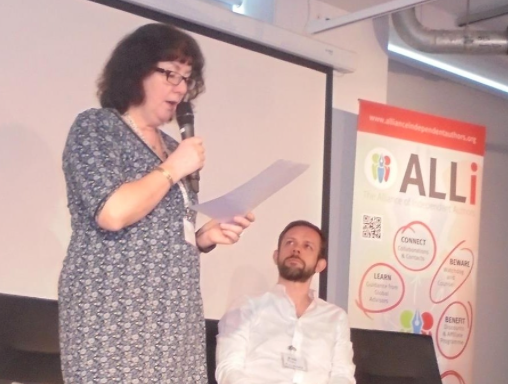 The campaign has now facilitated many worthwhile events and partnerships between ALLi members and independent bookstores, throughout the UK and globally. Debbie has worked closely with distributors, bookshops, readers and writers, in many different capacities. Among the developments of 2016, most notable perhaps was the launch of the first indie-author only bookstore, PJ Boox, by ALLi Partner Member, Patti Jefferson, in Fort Myers, Florida. And the moving of that store to a larger, downtown premises in 2016. The most recent milestone for the campaign is the launch in autumn 2017 of the book How To Get Your Self-Published Book Into Bookstores by ALLi Publications Manager, Debbie Young, which draws on the experience of pairing authors and bookstores, outlines the contraints, challenges, possibilities and opportunities for both sides, and outlines a number of case studies for other authors and bookstores to follow. Two years ago, The Bookseller reported the number of physical bookstores in the UK fell for the first time in living memory to below 1,000. It’s the same all round the world, but not because pbooks are going out of style. What’s changing is people’s buying habits. People are moving away from physical stores, or only setting foot in them to “showroom”, check out the physical product in store before going home to buy it online. In the last ten years, we’ve lost a third of our bookshops here in the UK. A third. That’s 500 bookshops. It’s a story that is replicated around the English-reading world. At ALLi, we believe that authors can help redress the balance back in favor of print and that we should exert ourselves in that effort. In short, authors do well when booksellers do well and we have more power to help than we might think. ALLi’s #Authors4Bookstores manifesto, proposes 21 easy actions which are within your power. Most of them will cost you little or nothing to carry out. And every time you do any one of them, you’ll be helping physical bookshops to survive. Buy books! If you plan to buy a pbook, and have a bricks-and-mortar store near you, buy it there. If the book you want is not in stock, they can usually get it for you just as fast as any online ordering service. It may not be cheaper, even allowing for saving the delivery cost, but it might well be. If your books are stocked in a particular shop, add it to the list of stockists on your author website. To ensure they continue to be stocked, you need to drive a pull -through of demand: getting the books stocked is just the first part of the process. Don’t just list the usual Amazon affiliate links or whatever, which earn you peanuts in any case, and are more effective in fuelling Amazon’s empire than your bank account. It will also score you points with any local bookshop looking you up online. Resolve to visit your nearest bookshop whenever you are on the high street or at the mall. Become a regular face there, befriend the staff, and before you know it, you’ll find an opportunity to tell them about your book, even if you didn’t have any intention of selling it there. Don’t be shy but definitely don’t go in with a sense of entitlement. Most booksellers will consider authors premium-value customers, whether or not they stock your book. Support other authors’ events there. It’s another way to become a familiar face and known supporter of the store. You’ll also pick up tips on how to run an author event (or not!) and might even gain a new author friend. Keep track of the kind of events they hold there, which they’ll have carefully chosen to suit their clientele. See if you can dream up one of your own in a similar mould, either on your own or with indie author friends. Then go all-out to bring an audience with you, who buy books at the event, whether yours or others. Stage a successful event, and you may even get asked back for more – because each time they see you in future, they’ll have pound/dollar/Euro signs in their eyes, seeing you as an asset to their business. If you’re staging local events elsewhere, show your support for the bookshop by inviting them, perhaps to run a shop for you, or even as a guest. Whether or not they wish to come, ask for a stack of their promotional flyers or bookmarks to give to your audience to promote their bookshop. If your local bookshop runs a festival, as many do, offer your services as a volunteer. Most festivals, small or large, rely on an army of volunteers to be financially viable. It’s a great opportunity not only to score points with your bookshop, but to network with potential readers and make new like-minded friends. Do it enough, and the bookshop will start to see you as one of their ambassadors, which will make them more likely to be ambassadors for your book too. If there are national or international bookish events going on that your local store is likely to engage in, you should also embrace them. If you a children’s or YA author, World Book Day provides a great opportunity to support our local bookshop by going in to be a resident author for the day, helping run activities for visiting children. If you’re a World Book Night book giver, you can designate your local bookshop as your pick-up point – an easy way to declare yourself as a passionate advocate of books and reading, rather than an egotistical author thinking only of his own book’s sales. If they hold a book group, or book groups meet in their shop, either offer to be a guest speaker to the book group, or join it as a reader – again, a great networking opportunity that will lead to other advantages. Subscribe to their online newsletter. You know how good it feels when someone subscribes to yours. If you blog, and host guests, consider doing an interview with your local bookshop proprietor or staff. If you’re a book blogger, consider also giving a shout-out to high street bookshops that you love, adding to them as you find more on your travels and on holiday. If they have an instore loyalty card, sign up for one. Who could resist having a store card branded Foyalty? (offered by Foyles bookshops in the UK). Especially one that earns you points and free coffees when you spend over a certain amount. Ask if you could take a photo of the store to go on your website. There’s bound to be somewhere you can use it as an illustration, even if they don’t stock your book. Then, when you use it, send them a link, which they may even share, which might drive them to consider stocking your book in future. Ask whether they could spare a supply of their branded bookmarks to be included in every copy of your book that you handsell. You’re effectively offering them free advertising space before a bookbuyer. Treat staff like the professionals that you both are. If you’re seeking a book for a particular purpose, ask for and respect their advice, which never fails to amaze me, unlike the “advice” that results from keyword searches on online retail sites (a recent Amazon search for books on Mothers’ Day yielded an array of tales of child abuse and other woes). Give books as gifts (so easy to wrap and post at Christmas and birthdays). Buy National Book Tokens / the equivalent in your country. Only redeemable in store and a great way to encourage children and young people to acquire the reading habit.